Deformed babies in bottles. Dangling doll limbs. Bleached skeletons posing. Kathleen Day’s photography hangs eerily from the walls of the Anna Leonowens Gallery. The collection, titled Vita Lineas, or Life Lines, is on display from Jan. 15 to Jan. 19 in Gallery 2A. Day, a photography student at the Nova Scotia College of Art and Design, says the photos were taken over a two-year period while travelling in Europe. She visited 11 cities in France, Portugal and Spain. “When I started creating this body of work I just focused on people and portraits because that’s where my interest has always been,” says Day. Her cameras captured it all. Day moved to Halifax from Edmonton, Alta., in 2008. In 2010, she decided to travel to Europe where she studied in both Paris and Lisbon. She even spent some time away from civilization while living in the mountains of Spain. Day brought her photos back to Halifax last year where she began her biggest challenge: presenting them as a cohesive piece of art. First, she needed to find a common theme. “The idea just sort of came to me that it was about mental and physical illness,” says Day. Next, Day had to find the best way to arrange her photos. At the exhibit’s opening reception on Monday night, Day stands proudly next to her exhibit. Several people congratulate her and give her hugs. She mingles with people in the audience. They ask questions about her work. Matt Brown studies painting and drawing at NSCAD. He wanders through Day’s exhibit pausing for a few minutes at each photo. “I’m really drawn to the scanned Polaroids, particularly,” Brown says. Art-lover Caitlyn Seco is also meandering through Day’s exhibit. She points to a photo of blurry hands. “I find hands tell more of a story than a face a lot of the time. You can’t really see the hands, but I kind of like that too,” says Seco. Day says she wants her audience to look at their own lives, and appreciate and be grateful for their health. Day graduates this spring and she says she hopes to continue creating art. Day will be speaking about her exhibit on Jan. 16 at 12:00 p.m. at the Anna Leonowens Gallery. 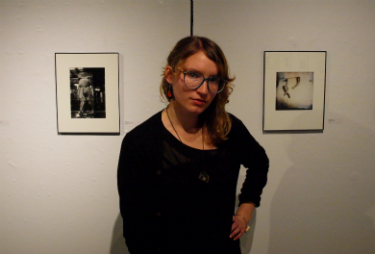 NSCAD students are showcased every week at the Anna Leonowens Gallery until the end of April. Very well written informative article. I agree with what the young lady above me wrote lol. Interesting read! What a well written article. It’s not often I stray to learn more after reading a piece like this. But I’m definitely intrigued to see her work and read more about her story.